· Cr. Ree Price and Cr. David Schefe at the 2014 DestinationQ Forum 16 – 17 September 2014 on the Sunshine Coast. SEGRA 2014 is bringing regional practitioners, businesses, researchers and government together to consider ways regional Australia can maximise opportunities. Key topics include: how greater connectivity can be harnessed to create regional significance, decentralised decision-making and improving business access to supply and demand chains regionally and globally. Cr. O’Neil has indicated an interest in attending the upcoming conference in his capacity as Portfolio Chair for Economic Development. The DestinationQ forum is Queensland’s most important gathering for the tourism industry and government. The theme “Growing your product – Growing our industry” aims to achieve the industry’s long term vision of Destination Success – The 20-year plan for Queensland Tourism. This year’s forum will continue to build on the work carried out over the past two years. Each year destination is now completing its own destination tourism plan, identifying its priorities to grow the industry. These annual plans are integral to the industry’s long term success and complement the 20-year plan for Queensland Tourism. The Queensland Government is committed to supporting regional economies and partnering with industry. Important issues on the agenda include: the rise of the independent traveler and building successful partnerships at a local level to grow tourism. Both Cr. Price and Cr. Schefe have indicated a keen interest to attend the upcoming conference. 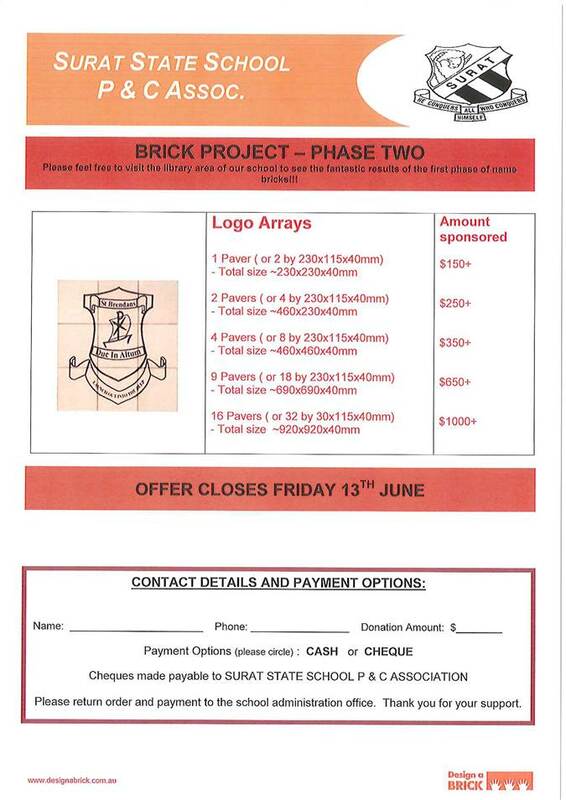 A letter has been received from the Surat State School P & C Association, requesting that Council give consideration to sponsoring pavers to develop a new landscaped area connecting the undercover area outside the library and the Big Shed pathway. That Council consider the request. 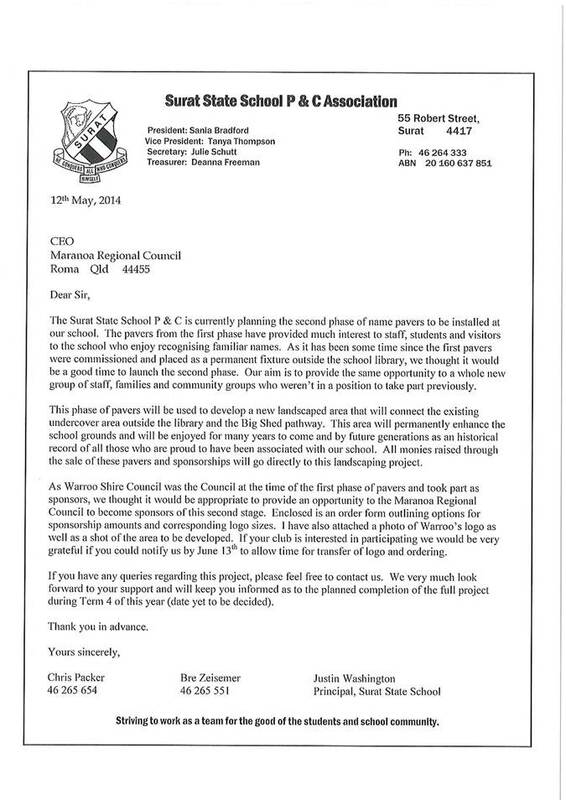 A letter has been received from the Surat State School P & C Association, requesting that Council give consideration to sponsoring pavers to develop a new landscaped area connecting the undercover area outside the library and the Big Shed pathway at the Surat State School. This is the second planned phase of name pavers to be installed at the school, and will enhance the school grounds for future generations. All monies raised through the sale/sponsorship of pavers will go directly to this landscaping project. The former Warroo Shire Council took part as sponsors of the first phase of the project. The letter of request and order form is contained as an attachment to the report. The sponsorship cost is on the basis of ‘per paver’ sponsored. Community Grants funds for the current financial year have been expended in rounds 1 and 2 of the program. Formal application has not been made under the program. If Council was to approve sponsorship, funds could be accommodated for under the Elected Members & Community Engagement Sponsorship budget.